Now I get “We have reached out to staff on site about the stream. We hope to have it up soon”. I get “Something went wrong during native playback”. Not very encouraging. I’ve not heard that before - is “draw” a verb in that context, or should it be “plays to a draw”? Not trying to go all MafiaMan on you, just curious if it is common usage. Yes, there was a complete cop-out - by the university president at the time (a feckless putz if ever there was one) - it was incumbent upon him to point out to the committee that none of the names under consideration met the criteria they had established, and demand that it be rectified. The party that decided that the modifier "Fighting" was to precede Hawks and only Hawks deserves a significant portion of the culpability as well. I said UND, not the committee (which is/was a part of UND), but ultimately the responsibility and blame lies on the university president at the time. In order: 1. Ultimately much, much less than keeping the current horsecrap one. 2. Sure, why not start there. 3. In a perfect world, me. Let’s see...Fighting Scouts with a Lewis and Clark Corps of Discovery theme. Done! I’ll even give in on the “Fighting”, just to show how reasonable I am. Infinitely preferable, I should think - for all involved - than for me to have responded to each of those posts with “you’re full of crap”. 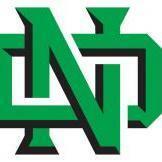 If a small group of hand-wringing, mouth-breathing, bed-wetters could convince the NCAA to ban Fighting Sioux, it should be more than possible to get UND to change Fighting Hawks to something THAT MEETS THEIR OWN GUIDELINES!!! The objection to Fighting Hawks is very much more legitimate, appropriate and defensible than the aforementioned group's objection to Fighting Sioux. 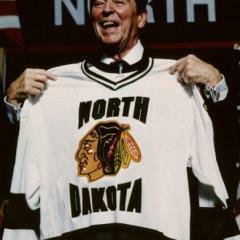 And as a disclaimer for the "Fighting Hawks Forever" crowd - yes, I understand why Fighting Sioux had to go (and I supported that decision), and that it will never be coming back. Personally, I’m not married to the ‘fighting’ qualifier, but I think it might make it more acceptable to the majority - just as having added it to ‘Hawks’ allowed it to win the vote. I believe that if it had been instead added to ‘Nodaks’, that would have been the one to garner the most votes. At the risk of repeating myself (again): It is not a logo, or more importantly name, befitting the state's flagship university. I suggest the powers-that-be change the name to "Fighting Scouts" with a Lewis and Clark Corps of Discovery themed logo(s). "Fighting" is particularly appropriate in this case since the expedition was comprised of members of the US Army. "Corps of Discovery" should also be used as secondary marking (on signage, uniforms, publications, merchandise, etc.). This would be much more relevant to the state, as they spent more time in what would become North Dakota than in what would become any other state, and much more marketable. Fun fact - the ND state highways that runs along the east and west sides of the Missouri River are designated "1804" and "1806", respectively, to commemorate the years Lewis and Clark went up the Missouri and came back on their return. Don’t post moronic drivel and you won’t get a down vote. It is not a logo, or more importantly name, befitting the state's flagship university. I suggest the powers-that-be change the name to "Fighting Scouts" with a Lewis and Clark Corps of Discovery themed logo(s). "Fighting" is particularly appropriate in this case since the expedition was comprised of members of the US Army. "Corps of Discovery" should also be used as secondary marking (on signage, uniforms, publications, merchandise, etc.). This would be much more relevant to the state, as they spent more time in what would become North Dakota than in what would become any other state, and much more marketable. Fun fact - the ND state highways that runs along the east and west sides of the Missouri River are designated "1804" and "1806", respectively, to commemorate the years Lewis and Clark went up the Missouri and came back on their return. It is not a logo, or more importantly name, befitting the state's flagship university. I suggest the powers-that-be change the name to "Fighting Scouts" with a Lewis and Clark Corps of Discovery themed logo(s). "Fighting" is particularly appropriate in this case since the expedition was comprised of members of the US Army. "Corps of Discovery" should also be used as secondary marking (on signage, uniforms, publications, merchandise, etc.). This would be much more relevant to the state, as they spent more time in what would become North Dakota than in what would become any other state, and much more marketable. Fun fact - the ND state highway that runs along the east and west sides of the Missouri River are designated "1804" and "1806", respectively, to commemorate the years Lewis and Clark went up the Missouri and came back on their return.